Last evening at the Stanley H. Kaplan Penthouse, New York Philharmonic Kravis Emerging Composer Anna Thorvaldsdottir (third from right, radiant pink tights) received a Lincoln Center Award for Emerging Artists, which recognizes extraordinary talent around the campus. She also received a Martin E. Segal Award, an endowed award. On April 4–6 the Orchestra will give the World Premiere of Metacosmos, Thorvaldsdottir’s Philharmonic commission, conducted by The Marie-Josée Kravis Composer-in-Residence Esa-Pekka Salonen. Another winner was pianist / composer Conrad Tao (fifth from left, cool embroidered jacket), who is writing a piece commissioned by the Philharmonic to be premiered in September, and who will also curate the Nightcap after the September 28 concert. Past winners include Philharmonic Concertmaster Frank Huang (2017) and composer Julia Adolphe (2016), whose music the Philharmonic has performed. The new year is kicking off busily for New York Philharmonic Kravis Emerging Composer Anna Thorvaldsdottir. Fresh on the heels of having a piece on one of NPR Music’s Top 10 Classical Albums of 2017, her Ró will be performed by Philharmonic musicians at Monday’s CONTACT! concert at National Sawdust, alongside works by Sarah Kirkland Snider, Ashley Fure, Du Yun, and Fernanda Aoki Navarro. After this amuse-bouche, don’t miss the main course on April 4–6: the World Premiere of Metacosmos, Thorvaldsdottir’s Philharmonic orchestral commission, conducted by Composer-in-Residence Esa-Pekka Salonen. So begins the rave review, by James R. Oestreich, of last night’s concert in The New York Times. He was referring to the World Premiere of Bent Sørensen’s Evening Land happening the same week that Sørensen received the University’s Grawemeyer Prize for Music Composition, one of the most important in the field. 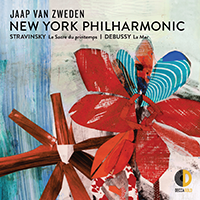 The piece, which was commissioned by the Philharmonic through the generous support of The Marie-Josée Kravis Prize for New Music, is inspired by, in Sørensen’s words, “a very special evening light over the fields” from his childhood in Denmark, and “the new vision of flashes of light and bustling activity” that he saw in New York many years later. The concertmaster — here, Sheryl Staples (in the absence of Frank Huang) — emerges from silence almost imperceptibly and in all innocence with a fetching little tune. The principal violist, Cynthia Phelps, eventually joins her, and they whisper across the podium until the other strings join in and overwhelm them. The ending, after the fray, is truly touching. The principal oboist, Liang Wang, plays the work’s longest strain, Mr. Sorensen’s tribute to his father-in-law, an oboist who died in May before he could hear the work. Mr. Wang lingers on a high note, handing it off to Ms. Staples, who leads the strings on tiptoes back to silence. The concert, conducted by Edo de Waart, also featured Mozart’s Piano Concerto No. 20 with Emanuel Ax (who “offered his usual elegant, understated virtuosity,” Oestreich said) and Brahms’s Symphony No. 2. It will be repeated tonight and Saturday night. Wanna hear something cool? It's "the aural soul of Iceland," in the words of NPR Music's Tom Huizenga. NPR Music is streaming In the Light of Air by Anna Thorvaldsdottír, the New York Philharmonic's Kravis Emerging Composer, as part of its First Listen series. It's from an eponymous recording, to be released August 28, and is performed by International Contemporary Ensemble. "This rumbling, evocative music ... seems grounded deep in the beautifully austere landscapes of her native Iceland," Huizenga writes. "This album is a good way to hear the magic of a faraway place and get a sense of a fascinating young composer on the rise." Thorvaldsdottír is also featured in this Sunday's New York Times (but it's online now), which calls In the Light of Air "breathtaking." Q2 Music has named In the Light of Air its Album of the Week, and you can watch it performed by the International Contemporary Ensemble here. You don’t have to spell it, but remember this name: Anna Thorvaldsdottir. She is “one of the most unique and expressive voices in the compositional scene today,” said Music Director Alan Gilbert, and she was just named the New York Philharmonic Kravis Emerging Composer. The Philharmonic made this exciting announcement at tonight’s final CONTACT! concert of the 2014–15 season. The award recognizes an up-and-coming composer as part of The Marie-Josée Kravis Prize for New Music. The Icelandic composer will receive a $50,000 stipend, including a commission to compose a work for the Philharmonic to premiere in a future season. She succeeds Sean Shepherd, who was named the inaugural Kravis Emerging Composer in June 2012. In 2012 Ms. Thorvaldsdottir won the Nordic Council Music Prize for her orchestral work Dreaming, one of the pieces on her album Rhízōma. Check it out here.